Singer John Legend is dismissing reports he was robbed by a cab driver in New York on Thursday (23Mar17). Reports surfaced on Friday (24Mar17) indicating the All of Me hitmaker arrived at John F. Kennedy airport on Thursday and was approached by a driver offering him a ride. According to the New York Daily News, John was speaking with the driver for a few minutes, when he allegedly took off running with the 38-year-old's bag. Editors at TMZ reported the bag contained $30,000 (£24,000) Cartier Panther cuff links, $500 (£400) worth of clothes, and a $500 pair of eyeglasses. John is now clearing up the reports, explaining the bag was left unattended and then taken. "This story is untrue," he writes on Twitter. "We use a trusted car service and they did not rob me. Our Delta (airline) greeter made a mistake and left a bag on the cart. "The bag was taken because it was left unattended," he continues. "The airport police caught the person who took it (on video) and retrieved my bag." Charges are reportedly pending against Agusto Hilario, who has been arrested in the past for illegally picking up passengers. 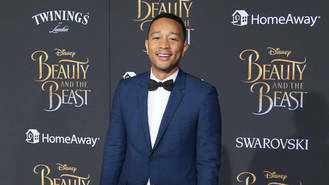 This isn't the first time John has faced drama at the airport - in January (17), the singer and his wife Chrissy Teigen experienced a vulgar verbal attack when a foul snapper asked them questions about their roots. Teigen took to Twitter shortly after the unpleasant encounter and detailed it for her followers, writing: "Paparazzi at JFK just asked me 'if we evolved from monkeys, why is John Legend still around?'" She added, "and people wonder why celebs lose it in pics... Also, john is right next to me. The balls! I was very kind. Answered cooking questions, then he came with that. F**king disgusting." John also spoke out about the incident and insisted it's a "shame" minorities still have to deal with hateful words. "We were right next to each other and we looked at each other like, 'Did he really just say that'," he told Variety. "And he really said it. He basically called me a monkey. Black folks have had to deal with being called monkeys for a long time and dehumanisation has always been a method of racism and subjugation of black people. That's just part of American history and it's part of the present, apparently. "We saw it with the former president, Obama, whenever people wanted to discount him or discount his wife, they compared them to apes. And we've seen that frequently... I'm not hurt by someone saying that to me because I'm smarter, I'm stronger. I look down on that person that would say something like that, but it's a shame that still exists." Selena Gomez is reportedly unhappy about her beau The Weeknd getting back in touch with his supermodel ex, Bella Hadid. Take That have confirmed there are no plans to tour in 2018 for their 25th anniversary. Ryan Tedder pushed James Blunt to be "bold" and "direct" with his lyrics. Salsa star Marc Anthony insists he'll always be a big part of ex-wife Jennifer Lopez's life, because she's his "goombah". Paul McCartney bonded with Kanye West by sharing a story about how the loss of his mother inspired him creatively. Future wasn't afraid to reflect on his love life and vulnerabilities in his new music. Demi Lovato's "life depends" on her staying sober. Beyonce fulfilled the dream of a teenage cancer patient by calling her using FaceTime on Wednesday (22Mar17).